One more new Gianluca Becuzzi release on Silentes, this time in collaboration with Luigi Turra. Composer of musique concrete and graphic designer whose main interest is the musical balance between silence and the tactile perception of sound, Turra’s works were published by labels such as and/OAR, Unfathomless, Non Visual Objects, Smallvoices and many others. A lot has already been written about Becuzzi, here we would just like to remember his historic Darkwave / Industrial project Limbo, his more recent Kinetix and Noise Trade Company incarnations, and the long collaboration he carried on with Fabio Orsi. 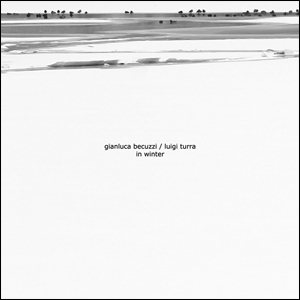 "In Winter" was recorded between 2008 and 2010, with Becuzzi mostly taking care of field recordings and programming, and Turra giving his own contribution playing acoustic guitar and piano. Light as the snowflakes that entitle them, these nine compositions offer dreamy atmospheres that rely on minimal structures and evoke visions of lonely and lazily wintry landscapes. Music for the heart and the mind, delicate representations of quiet moods translated into harmonic sequences that combine environmental synthesis with influences of a refined sophistication.